Fentanyl is a powerful drug that can be 50 times more potent than heroin. First responders are being warned to take precautions to avoid being exposed to the drug. Photo courtesy of the Drug Enforcement Administration. The explosion of the opioid epidemic that is responsible for thousands of overdoses and deaths is a consistent problem that EMS and law enforcement encounter on an almost daily basis. Usually, the victims of these powerful drugs, such as heroin and fentanyl, are opioid users, who EMS personnel and law enforcement are regularly called to assist. 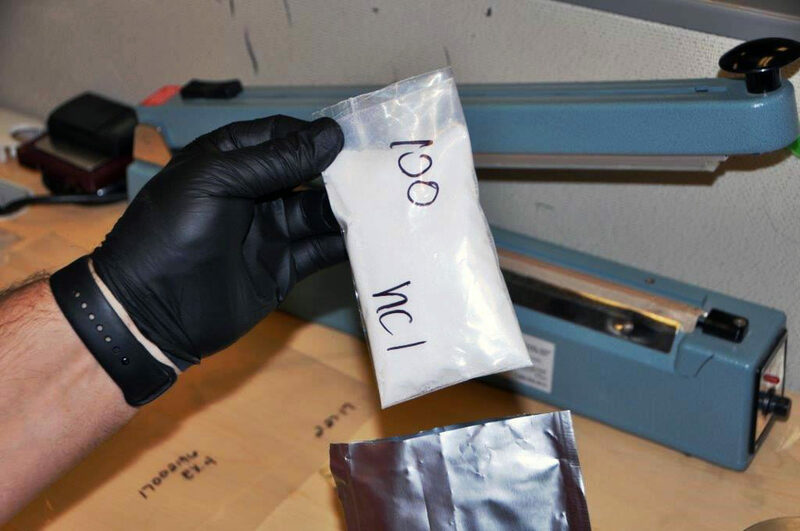 However, first responders are also being warned about the increased risks they face of being exposed to these deadly drugs, specifically fentanyl—a popular synthetic opioid that is 40 to 50 times more powerful than heroin. To respond to these dangers, the Drug Enforcement Administration (DEA) released a field guide called “Fentanyl: A Brief Guide for First Responders” for EMS and police who find themselves responding to opioid-related calls. The warnings have become more urgent in recent months due to numerous cases of accidental overdoses and exposures involving EMS and police. In May, Chris Green, a police officer with the East Liverpool Police Department, was accidentally exposed to fentanyl during a routine traffic stop after he inadvertently ingested the drug through his skin. Green needed four shots of Narcan, an emergency overdose medication, to be revived after collapsing from the effects of the drug. In another case, two Paramedics and a sheriff’s deputy in Hardford County, Maryland, were treated after showing signs of opioid exposure while treating an overdose victim. “It is important to get the word out to everyone because it may be the first responder who needs to have Narcan administered,” said Baltimore City Health Commissioner Leana Wen. The risks of accidental exposure are so high, in fact, that some emergency personnel have even begun carrying Narcan kits for drug-sniffing K-9s, just in case the dogs ingest the deadly drugs. The DEA guide, along with a National Institute for Occupational Safety and Health manual on preventing fentanyl exposure, suggests certain precautions be taken to lower the risk of coming in direct contact with the substance. Personnel should be able to recognize the signs and symptoms of an overdose, be aware of the ways fentanyl can be ingested, and only allow trained professionals to handle substances that are suspect. The DEA video “Fentanyl: A Real Threat to Law Enforcement” offers advice on how police and EMS can protect themselves from the dangers of fentanyl. This entry was posted in Community, Drugs & Pharma, Emergency Preparedness, Field Resources and tagged opioids. Bookmark the permalink.